WATER Horikin delights in depicting earthly creatures and has varied traditional themes slightly. Young Kintaro here rides a slippery catfish, a red goldfish swims upstream to spawn, and the Lotus Prayer encircles the left thigh while a whiskered catfish forlornly cuts through the prayer. 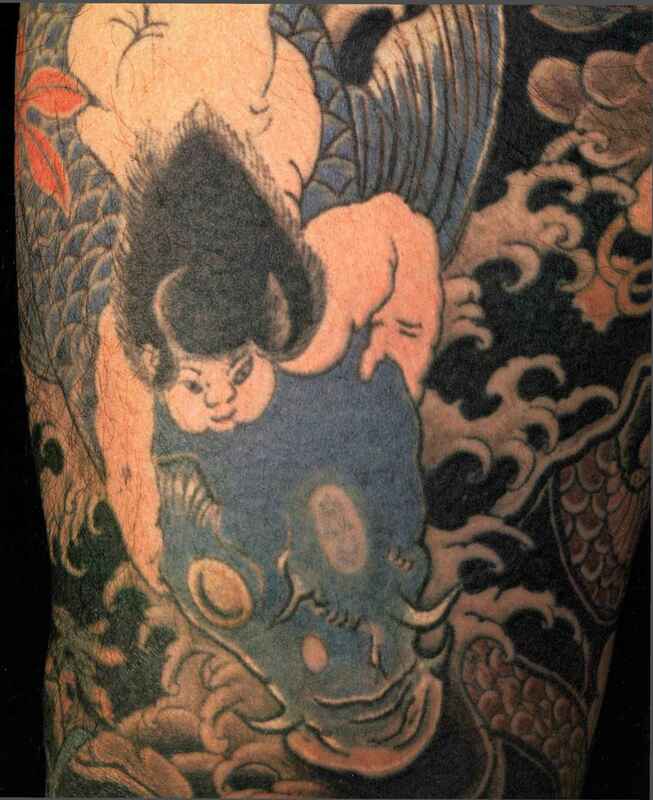 Opposite: Close-up of Kintaro riding the catfish. 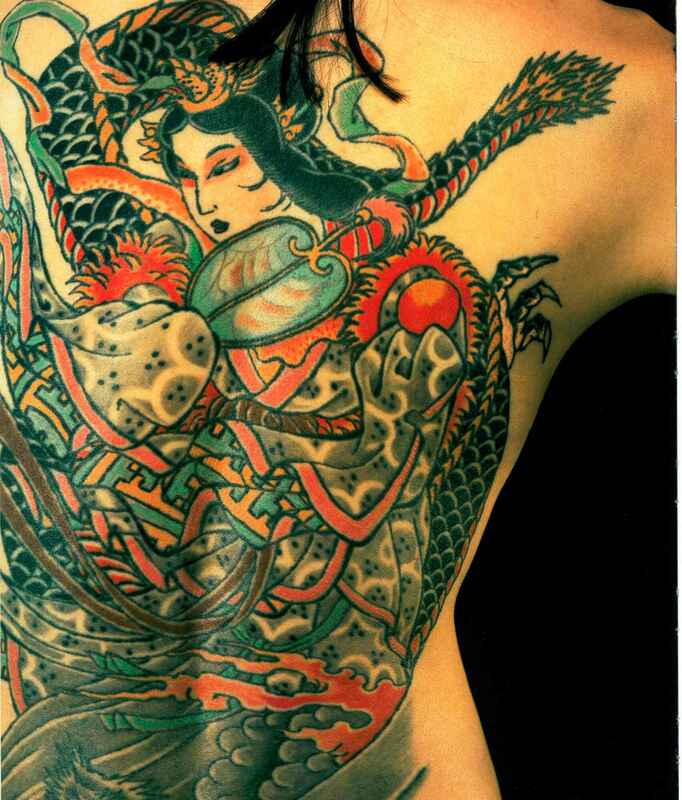 BLOSSOM Horiyoshi III turned for this full-back tattoo to Utamaro's ukiyo-e series of beautiful women of Yoshiwara's gay quarters, many of whom were themselves tattooed in the eighteenth century The cherry blossom is one of the great symbols of Japan and popular in tattoo parlors. The blossom bursts upon the air in earliest spring, and within three days its petals fall. The brevity of its beauty links it inevitably to the warrior's short life and to the courtesan's brief span of youth and popularity The courtesan depicted here has the flush of eroticism in the cherry color around her passionate eyes. BENTEN WITH FAN Benten (Sanskrit Sarasvati) is the maiden deity of water and music and the only woman among the Seven Gods of Luck and Fortune. She represents the gentle arts of music, painting, literature, and soft speech. She is always pictured with a sea serpent and here is shown with her Chinese fan of yak leather. 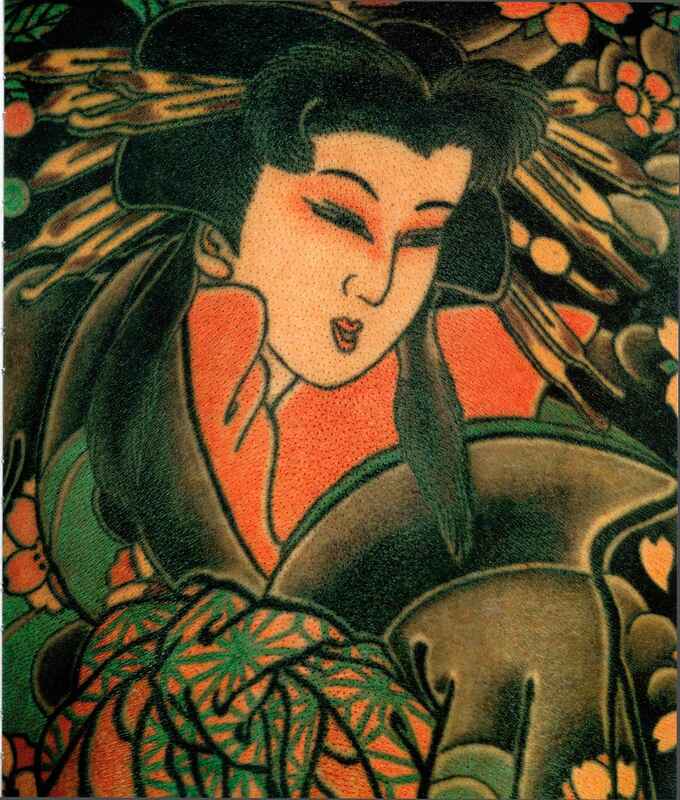 This masterpiece is signed Horiyoshi III (upper left-hand corner). 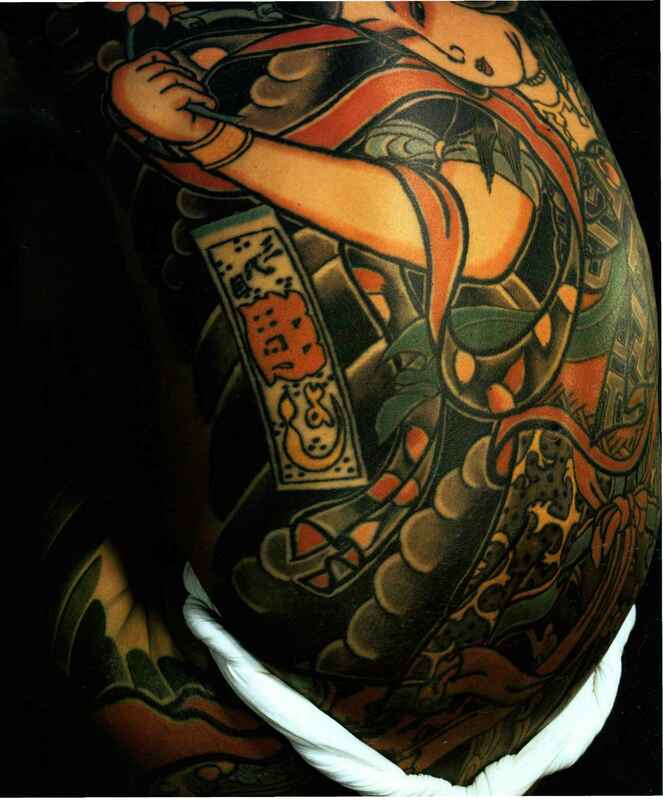 SIGNATURE Another version of Benten, deity of Good Fortune, the only female god still venerated in modern Japan. 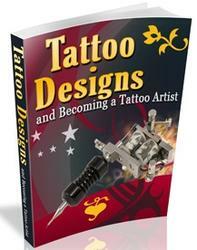 This time the tattoo is flamboyantly "chopped" by Horiyoshi Ill's official signature.